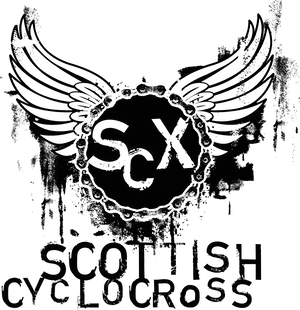 Another fantastic turnout at Auchentoshan today with well over 100 riders in the main event again. Some exciting racing saw Scotland's winningest husband and wife team repeat their fine starts to the season with Ruth and James Fraser-Moodie emerging victorious in the senior events. Results and a race report will be posted here as soon as we have them. I only managed about 500yds before something nasty put a half inch gash in the side of my tyre. As I'm better with a videocam than I am with a puncture repair kit (or a bike) I decided to record the rest of the race.